Where to place the shoe cabinet? It is paramount to be sure of the spot where the shoe cabinet will be situated beforehand. This will make the decision process much more comfortable and more streamlined. Whether in a corner, against a wall in the hallway or near the front door, the amount of space available decides the dimensions of the cabinet. Once a position has been selected, the most practical design for your respective needs is next on the list of things to consider. Cabinets can be placed on the floor or mounted on a wall for ease of access and to save floor space. With the myriad of shoe cabinet styles to choose from out there, it is necessary to focus on which kind is best for your particular requirements. The short, wide ones can double as console tables when stationed in a hallway. Usually occupying corners, tall shoe cabinets are convenient and unobtrusive. Styles vary with regards to the way the cabinet opens up: doors can be double-sided, can slide or even hinge open! Cabinets with adjustable shelving allow for different sized shoes, as well as storage of other stuff. Opting for shoe cabinets with one, two or even four attached drawers makes stashing away clutter a complete breeze. This is entirely dependent on how many pairs of shoes are strewn around! However, shoe storage cabinets can store anywhere between 10 to 30 pairs, depending on its size! If the lack of space is a concern, buying two separate smaller shoe cabinets (they can be the same or different styles) and locating them in different areas will increase capacity without appearing to crowd the place. Wooden shoe cabinets go well with houses that have a theme of the same. Cabinets made of glass or those that are mirrored are suitable for homes that have a neutral, contemporary idea going on while shoe cabinets with a luxuriously glossy finish are an ideal option for the ultra-modernists among us. 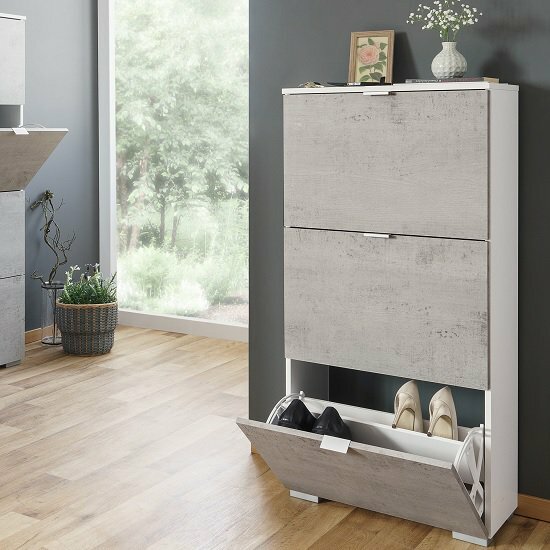 Now that you have a good idea of what you are looking for a hurry over to Furniture in Fashion to explore their versatile collection of shoe cabinets at the most reasonable prices.